A small group of Dare County residents joined the North Carolina Coastal Federation on March 25 to learn about rain harvesting and to exchange ideas about how they can get creative with reusing stormwater in their yards. Ann Daisey gives a presentation about stormwater runoff and its community impact. Those who participated in the rain harvesting workshop learned about how stormwater runoff impacts our water quality and how harvesting it can reduce stormwater runoff. They also enjoyed sharing unique techniques they implement at home to harvest rainwater. Upon completion of the workshop, they received a free rain barrel to use at home. The group talked about the creative ways they plan to utilize their rain barrels. Daisey said some were going to paint their barrels, while one couple wants to try to use collected rainwater in their sprinkler system. Another participant offered recommendations for how to keep mosquitoes away. Ann Daisey hands out rain barrels to participants. In addition to learning about stormwater runoff and ways to use their own rain barrels at home, they also had the opportunity to see the best management practices (BMPs) that are installed at the federation’s Wanchese office. These BMPs include a rain barrel, rain garden, permeable pavement and bagged oyster shell. 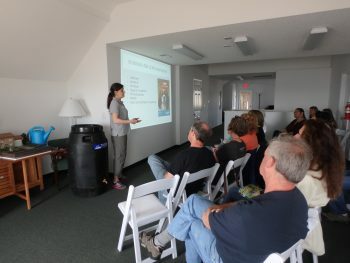 This workshop was made possible through a grant from the Northeast North Carolina Coastal Research and Environmental Education Fund, which is a fund from the Currituck-Dare Community Foundation. “A casual, informative environment to share stories and techniques made for a wonderful workshop that many hope will be offered again,” Daisey said. 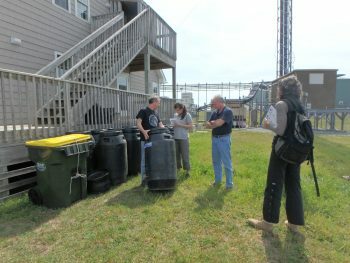 To learn more about what the federation is doing to reduce stormwater runoff on the coast, visit nccoast.org/stormwater. Visit nccoast.org/smartyards for do-it-yourself solutions to reducing runoff at home.